Hawaiian Shirts in the Electric Chair bears the marks of experience. 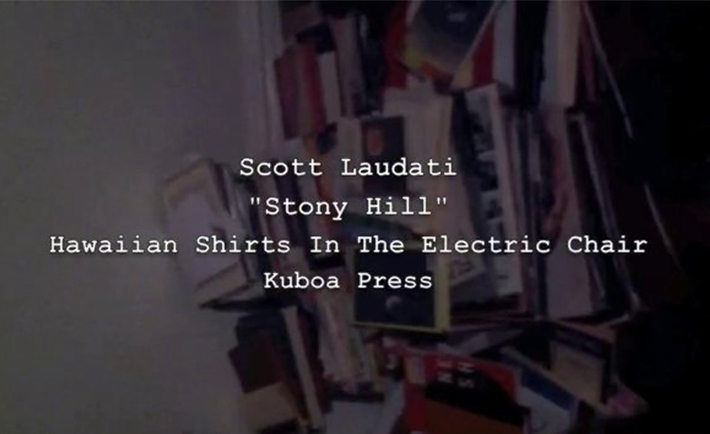 Scott Laudati, in his first book of poetry, summons a plethora of different situations to describe a world view that is at times cynical, but at others loving and understanding. With rhythm that is barely there Laudati creates poetry out of the everyday. If you want to look hard you could call it dirty realism, but if you’re being simply observant you get the fact that these descriptive sentences of his contain something different from the mundanity of gentrification. His poetry bear the marks of life like fingerprints, as honesty shines through under the loose rhythm, keeping you interested in what he has to say. The rhythm itself sometimes seems to die away, to pick up and slacken a pace that wouldn’t be out of place on stage or in a spoken word jam. The view exhibited in this book of poems is not atypically optimistic. Cynicism is in abundance, in the lines where he remains observer, but there are moments of thought when the kernel of his situation is revealed, usually coming as a reaction to what went before, shining hope or despair above the refrains describing a first date or the aftermath of a miserable news bulletin. A standout in the book, “Take the Path For Cocaine and Plath” is written hardboiled as Laudati describes the stratagems of getting someone into bed, while he’s capable of taking a completely different tack, as seen on “The Dog Days are Over”, in which he depicts growing old as becoming irrelevant. This book of poems reads like a book of thoughts or happenstance occurrences, to create a collage describing Laudati. His tone is communicated well and, by the last poem, you have the feeling of familiarity, almost like kinship.